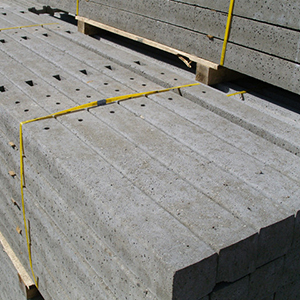 Concrete posts and concrete gravel boards. Maintenance free, long lasting and ideal for use with treated fence panels to prevent water ingress and rot. Concrete gravel boards separate the fence panel from ground contact to protect against the risk of rot. Concrete repair spurs are an economical way to straighten and strengthen older wooden posts. Concrete Posts from Challenge Fencing. A high quality product you can trust. If you choose Concrete Posts from Challenge Fencing you will receive a high quality product that will stand the test of time. Combined with the strength and resistance of a treated wooden fence panel your fence would stand tall and strong come rain, wind or hail. A fence is only as strong as its weakest point and with concrete posts installed; you can relax knowing that you’re choosing a very strong damage resistant material for your fence posts. One of the many great benefits of using concrete posts is how easy they are to maintain once installed. You don’t have to worry about any maintenance, as long as they don’t suffer too much abuse, they can easily last decades. Whilst many will argue that wooden fence posts are cheaper, concrete posts usually last considerably longer than their wooden alternatives. So whilst the initial cost may be slightly higher, concrete posts provide you with a greater value for money. 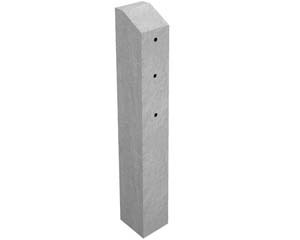 Additionally you’ll find all of our concrete posts at fair competitive prices; further increasing the value for money you get when choosing concrete posts from Challenge Fencing. No matter your fencing needs we’re always up to the challenge. 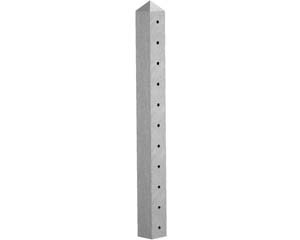 We stock a wide variety of concrete fence posts in a variety of sizes. We’re confident you’ll find a fence post that suits your needs.